If you are shopping for a new equine companion but do not want a horse, you may want to consider a donkey or a mule. Donkeys and mules are confused for one another by individuals who do not understand what makes a donkey a donkey and a mule a mule. Donkeys, also known as burros, are asses, not horses. They are shorter and generally hardier than horses. Donkeys have been used for transporting people and goods since biblical times. While donkeys have a reputation for being stubborn, they are also notoriously smart and capable of keeping themselves and their passengers away from danger. A mule is produced when you breed a male donkey to a female horse, also known as a mare. A "hinny," meanwhile, is produced when you breed a stallion, or male horse, to a female donkey. Mules possess characteristics of both of their parents but are typically sterile and unable to reproduce. You can not breed a mule to get a mule. You have to breed a horse to a donkey to get a mule. Donkeys tend to be most easily identified by their long ears, but they possess other telltale characteristics. Donkeys lack the wither bump that horses have above their shoulders. Donkeys have flatter backs than horses, smaller hooves, coarse and bristly manes, and thin tails. Donkeys are smaller than most adult horses. Mules can take after their horse parent or their donkey parent, making easy identification a little bit trickier than it is with an animal who is 100 percent horse or donkey. 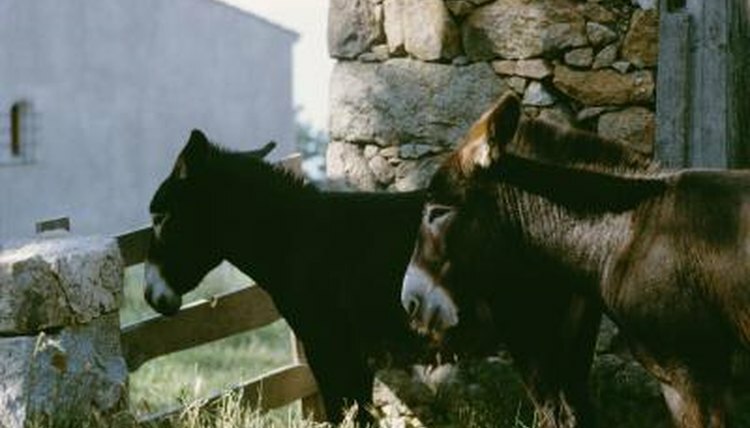 Mules often have the flatter spinesand larger ears that their donkey heritage passes on to them. However, mules tend to be larger than donkeys, with more delicate bone structure. Mules can be used for many of the same riding disciplines that horses are used for, depending on the quality of the mule.